As a specialist in mobile applications, Duo has created the “Pundit” app for iPad. Now you will always have everything at hand to sell yourself as a strong brand. With Pundit you will have always everything at hand and available on your iPad to efficiently sell yourself as a strong brand. All the information you need for your appointments has been stored in one place and can be shown to everyone even without being connected to the Internet. If your potential customer wants to see your website, prices, offers, company presentations, graphics or video files you can display them with one simple tap on your iPad. Or if you would like more information about the person that you are meeting later that day then you can find all the material you need in Pundit. 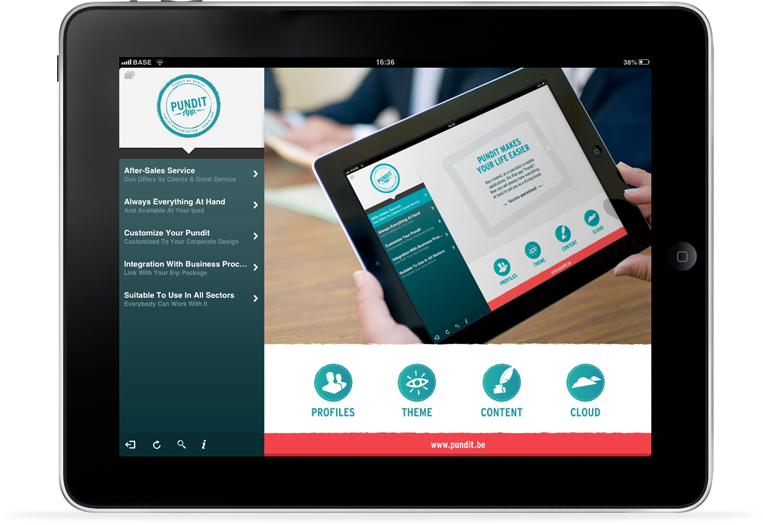 Pundit uses a clever CMS system and is linked with the ERP package of your organization. This package brings a large number of processes of the company together (such as inventory systems, business administration, logistics, ...) and connects them so that everyone can see all input in the database. When any adjustments are made, the data in the app is automatically updated so that everyone always has the latest information available. Pundit will be completely customized in line with your corporate design so that the application remains recognizable for everyone. Your needs will also be taken into account. You can change the names of various buttons, adjust the colors and choose in which folder you want your data stored. You can even integrate your webshop into the app, and much more. This way, you know where you can find everything and show it to your clients. Pundit can be used in any sector. Everybody can work with it because of its ease of use. Moreover, your productivity will increase which only provides more benefits for your business. One of the many advantages of Pundit is that the app’s settings can easily be adjusted via the CMS-system. In this way, the app is very user-friendly and it can be ensured that a person with one profile can see more information on his iPad than another. For example, account managers will find more folders on their iPad than people from of the technical repair services from the same company. When the application is connected to the Internet, all adjustments that were made to the CMS system will automatically be pushed to all profiles. The user can also create his own folder where he can store personal information. Discover the many possibilities Pundit offers for your business. Contact Duo today for more information! Duo offers its clients excellent service. After purchase you can always contact us with your questions and we will give you all the help you need. Barry Callebaut is a major international producer of the finest Belgian chocolate and employs over 6,000 people in 30 countries worldwide. They chose the Pundit application to always have all necessary documents available and to avoid carrying around lots of papers. Price lists, leaflets, order forms, recipes, technical specifications, ... are now all centralized on the iPad. 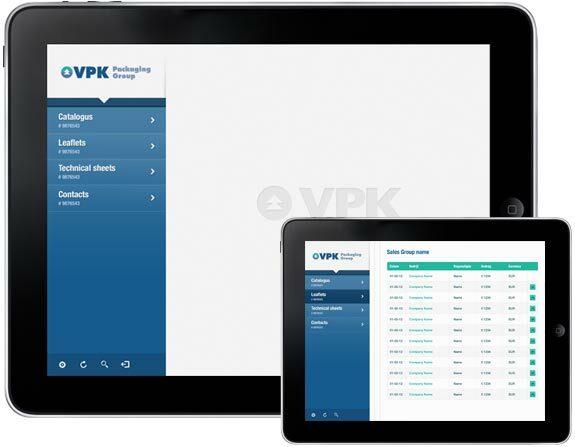 Because the app is linked to the ERP system of the organization orders can also be entered directly. 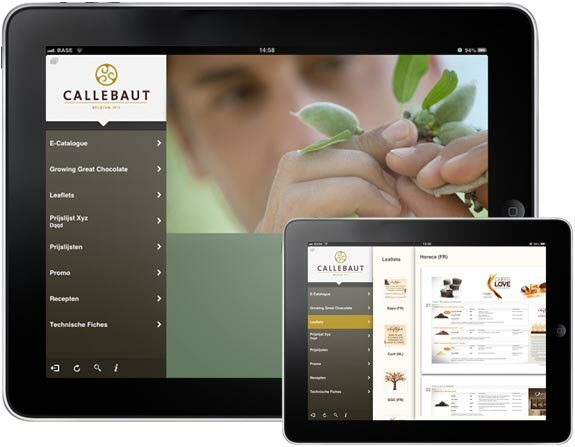 The layout of the app was also fully adapted to Barry Callebaut corporate design style to keep the recognizability high. VPK Packaging Group is a leading Western European packaging group, developing and producing innovative, protective and logistical solutions and making maximum use of recycled fibres.This company also uses Pundit. They fell for the ease of use and the link with the company’s ERP package. They can now find all their contacts, memos, orders, ... in one location. Be as smart as our other clients and choose for Pundit!